Hey, everyone, jrpbsp here… Here’s my second review for the week. Up next is is ‘Uncanny X-Men: First Class’. Hope you enjoy it. RECAP: The issue opens with the helicarrier falling towards Jean Grey. She makes a telekinetic slide and is able to redirect the massive ship back into the air where it limps away. The Knight who was confronting Jean and Storm, Sleeping Mist, flies away to find the Knight who threw the ship. Back at the mansion the large Knight, Drowning Shadow, attacks the female Knight, Sky Song, who easily defeated the X-Men. Without the sword that was taken by Nightcrawler, the girl is at a disadvantage and is forced to flee. Nightcrawler survives his painful teleport and ends up at the Knights’ home. He enters and finds the place is a trophy room and one of the heads on the wall is Xavier’s. 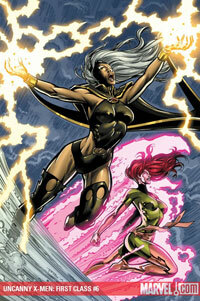 Storm returns to the mansion alone and the X-Men are briefed on the Knights by Lilandra. She tells them that the Knights are split into two teams of three and they are unbeatable. They will fight and destroy everything, the world has only a few hours to live. Nightcrawler finds out that Xavier’s Astral Form is not dead as he wakes up at Kurt’s touch. The pair head out to explore and find a single human looking being at the center of the lair watching all the Knights from afar. The X-Men regroup and head for New York to confront the Knights who are fighting each other. Jean shows up as Phoenix to where Cloud Runner and Sleeping Mist are fighting. She impresses them enough that they join together to fight her. Although they are shielded against telepathy, Jean’s telekinetics work fine. The X-Men manage to get in touch with Dr. Corbeau who tells them that the recent solar flares were all caused by the Knights fighting on the sun. While they talk, all six Knights come together to fight the Phoenix. As she falls before the onslaught, Corbeau tells the others that the flare which turned Jean into the Phoenix was generated by the Knights. MY TAKE: While this issue is not bad, it is definitely missing something in terms of story and characterizations. The Knights are simply too powerful to be a believable foe and too much time is given to their internal battles. The plot is very simple and yet there is still no room for broader characterization. About the only ones that get any development are the Knights. I do like having well-fleshed villains but the Knights are still pretty one dimensional even with the extra focus. I do give the story points for being creative and trying to invent a new and powerful foe for the team. Most of the time these flashback titles only give us familiar faces and situations which, while nice for the retroactive feel, does tend to feel a bit stale. Still the tale is a victim of its own ambition and it is hard to overlook the major ramifications of such an massive event in Marvel having never been referred to again. That is actually the biggest flaw of the issue, it seems like it is trying to rewrite history. Something as formidable as the Knights should have appeared again or at least been referenced. There could be some sort of trick of erasing the memory of everyone on the planet but that would be a major cop out. Also, the Phoenix’s history is very well and clearly documented and is already confusing enough. Trying to tie it into to this new foe is a bad idea esepcially since it occurs before the issues we know, so it can not even be considered a ret-con. In the end this would be a much better story if is was set in the present or was a bit smaller in scope. As it is, the tale is trying to outdo what was in the original series and involve the X-Men in global events where they were never really present before. It is almost like trying to they are trying recreate the Dark Phoenix story but you can not do such a monumental tale in a series that takes place in between issues of continuity. Taken as a stand alone story in an alternate world it is a pretty decent read, but as a First Class tale it just does not work.